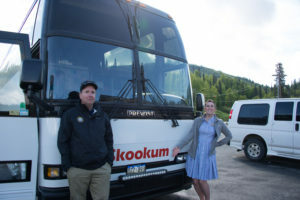 Bill and I just got back from a Big Adventure – a trip to Alaska with a few dozen knitters, spouses, family and friends arranged by CraftCruises. I am invited to teach lots of places, which are all delightful. Oddly enough, Bill wanted to join me on this one! This was our very first CraftCruise, and I try not to have too many expectations – but Wow. They really know how to organize a good time. Bill took several thousand photos, of course, and he is now weeding them down and editing them to send to CraftCruise, to share with the other participants. I’m going to start here with some photos of the land tour, which took us into the interior of Alaska before boarding the ship. Our land tour had the best guides, ever! John was our driver, and could not have been kinder and more helpful. Stephanie was funny, interesting, and knowledgeable. She kept us very entertained with stories about what we were seeing outside the windows, and the areas we traveled through. I think she is planning to learn to knit, now, too! 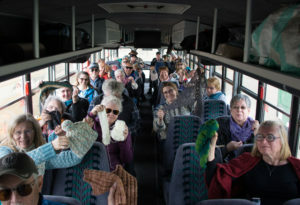 We got a lot of knitting and crocheting done on the bus! Here, Bill had us all hold up our current projects. Yay! A grown Dall sheep. Those are horns, not antlers. They are not shed with the seasons, but grow with the animal. This fellow was walking alongside the road, and kindly posed for us. 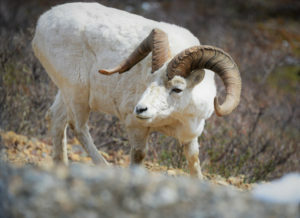 Dall Sheep are native to Denali, and protecting the flocks led to the creation of the Denali National Park and Preserve, in 1917. 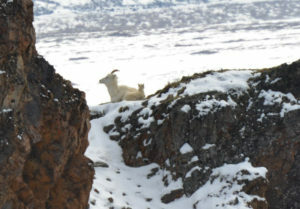 We spotted this sheep, and were astonished to see the baby nestled in there, when it was magnified in Bill’s camera lens! There will be lots more to report, as we visited Arctic Qiviut: a fiber mill, lots of yarn stores, went on a Tundra wilderness tour, and visited an Alaska Husky training facility, and other adventures on the land tour. Stay tuned!